 Neumann 1909, pp. 19 - 21, no. 26. See also letter from Mrs. Albert E. Goodhart to Ethelwyn Manning, Frick Art Reference Library, dated New York, December 20, 1934 (Frick Art Reference Library Central Correspondence, Private Collections, New York City; The Frick Collection / Frick Art Reference Library Archives); Upeniece 2005. According to Friedländer and J. Rosenberg 1932, pp. 67 - 68, no. 204e. See letter cited in note 1 above; see also Duveen Brothers, Items removed from the apartment of the late Mrs. A. E. Goodhart, dated September 19, 1952 (Duveen Brothers Records, box 157, folder 1, Special Collections and Visual Resources, Research Library, Getty Research Institute for the History of Art and the Humanities, Los Angeles). Cincinnati 1959, No. 120, ill.
Cologne, Antwerp 2000 - 2001, No. 25, ill.
Munich 2001, No. 11, ill.
Cat. New York 1998 43-47 No. 9 Fig. Cat. New York 1995 220 Fig. Title Lucas Cranach's Cupid as Honey Thief Paintings. Allegories of Syphilis? Lucas Cranach the Elder began painting depictions of Venus with Cupid taking honey from a beehive in the mid-1520s. To judge from the numerous surviving variants, the theme was one of the most successful products of that artist’s workshop. The subject is based ultimately on the nineteenth idyll of Theocritus, which tells of Cupid being stung by bees, whose hive he raided in search of honey, and then complaining to Venus of the great pain inflicted by such small creatures. Venus, amused, likened Cupid to the bees, remarking that he, too, is small and, as the god of love, also a bringer of great pain. The Latin quatrain that appears in Cranach’s paintings is an adaptation of Theocritus’s verses by the poet Georg Sabinus. Although in the 1998 catalogue of the Lehman Collection in the Metropolitan Museum the present work was attributed to Cranach and his workshop and dated 1530 according to the inscription on the tree trunk, closer technical scrutiny has shown that it is in fact an old copy after a lost original, as was already maintained by Dieter Koepplin in 1976. Dendrochronological analysis of the oak support, which is original to the work, indicated an earliest possible fabrication date of 1570 and a plausible one of 1580 or later for the painting. In addition, the technique used to depict the flesh is unlike that normally encountered in works of the Cranach studio, either under Lucas the Elder (d. 1553) or his son Lucas Cranach the Younger (d. 1586). Whereas in Cranach paintings the flesh is usually built up with thin translucent glazes of grays, browns, pinks, and whites over a light base flesh tone (with greater emphasis on pink and red glazes in the second half of the century under Lucas the Younger), in the Museum’s picture the flesh modeling is uncharacteristically thick, pasty, and opaque, relying heavily on a palette of mixed browns. Furthermore, the application of paint throughout the present work is broader and more summary than the precise execution characteristic of Cranach and his workshop. This is immediately apparent, for example, in Cupid’s ear and right hand, Venus’s face, and the hastily sketched-in city at the right. Comparison with a fine autograph version of the subject, such as the example dated 1529 in a private collection, clearly demonstrates the considerable distance of the Museum’s painting from Cranach’s handling and execution. A nearly identical version of the composition, formerly in the Björnstjerna Collection, Stockholm, is likewise marked with the winged serpent insignia and a date of 1530, but also shows evidence of having been painted considerably later. Koepplin suspected it, too, of being an old copy after a lost original. It exhibits a similarly summary handling of the anatomical details, the foliage, and the background landscape and buildings. The diaphanous shift that has been added to Venus is of a type frequently encountered in the decades around 1600. Like the Museum’s picture, the ex-Björnstjerna version is on oak, with the wood grain running horizontally,counter to the longer dimension. This is an uncommon feature, since a panel’s grain is normally oriented parallel to the longer dimension. Dendrochronological analysis of the panel of that picture indicated a felling date between 1607 and 1637 for the tree from which it was made. The similar paint handling and the two instances of oak with an atypical grain orientation raise the possibility that the Museum’s and the ex-Björnstjerna versions were painted by the same hand — the same copyist working from a lost original — sometime after 1607. The somewhat earlier dendrochronological dating of the Metropolitan’s panel, which establishes only a terminus post quem,does not exclude the possibility. An enduring interest in the present composition is furthermore documented by the existence of yet another copy, probably of the later seventeenth or eighteenth century, whose current location is unknown. In addition, in 1957 Pablo Picasso made a gouache painting after a magazine illustration of the Lehman panel. The present discussion serves as an addendum to the entry by Charles Talbot in the 1998 catalogue of the Robert Lehman Collection (Sterling et al. 1998, pp. 43 – 47, no. 9). It offers bibliographical updates and a new assessment of the attribution and dating. See the listing of known variants in Herrmann Fiore 2010, pp. 111 – 12. The earliest surviving example, now in the National Gallery, London, dates about 1526; see Friedländer and J. Rosenberg 1978, p. 119, no. 246L; Caroline Campbell in London 2007, pp. 80 – 83, no. 2, ill. For broader considerations of the subject, see Dieter Koepplin in Basel 1974, vol. 2, pp. 655 – 56, under no. 569; Koepplin 2003b, pp. 37 – 51; Pérez d’Ors 2007, pp. 85 – 88; Herrmann Fiore 2010, all with references to earlier literature. See Bath 1989, pp. 68 – 69; Pérez d’Ors 2007, pp. 87 – 88. Koepplin 2003b, pp. 37 – 38, has proposed both Melanchthon and the electoral Saxon secretary and court historiographer Georg Spalatin as likely iconographical advisers. These first two lines Sabinus borrowed and modified from Ercole Strozzi’s Theocritus translation published in 1513 (see Leeman 1984, p. 275). Talbot in Sterling et al. 1998, pp. 43 – 47, no. 9. This is the traditional opinion; see also Neumann 1909, pp. 19 – 21, no. 26; Friedländer and J. Rosenberg 1932, pp. 67 – 68, no. 204e; V. Campbell 1957, p. 29; Charles Sterling in Paris 1957, pp. 7 – 8, no. 9; Cincinnati 1959, p. 20, no. 120; New York 1960, n.p., no. 15; Descargues 1961, p. 59; Russoli 1962, pl. 163; Szabó 1975, p. 90; Friedländer and J. Rosenberg 1978, pp. 118 – 19, no. 246E; Baetjer 1980, vol. 1, p. 36; Hutton 1980, p. 131; Görel Cavalli-Bjorkman in Stockholm 1988, pp. 133 – 35; Baetjer 1995, p. 220; Bettina Back in Cologne and Antwerp 2000 – 2001, pp. 280 – 81, no. 25; Back in Munich 2001, pp. 152 – 53, no. 11; Pérez d’Ors 2007, p. 86, n. 1; Herrmann Fiore 2010, p. 111. Koepplin in Basel 1974, vol. 2 (1976), p. 787, n. 1. Wood identification and dendrochronological analysis by Peter Klein, Universität Hamburg (report, May 12, 1997, curatorial files, Department of European Paintings, MMA). Klein’s dendrochronological analysis indicated an earliest felling date of 1568, an earliest possible fabrication date of 1570, and a plausible fabrication date of 1580 or later. For discussion of the various techniques for painting flesh tones used by the Cranach workshop, see Heydenreich 2007b, pp. 193 – 207. Contrary to the statement of Charles Talbot in Sterling et al. 1998, p. 47, there is no evidence of extensive retouching in the face of Venus. Friedländer and J. Rosenberg 1978, p. 118, no. 246B; Bodo Brinkmann in Frankfurt and London 2007 – 8, pp. 352 – 53, no. 112, ill.
[13 Stockholm 1966, p. 513, no. 1289; Friedländer and J. Rosenberg 1978, p. 118, no. 246D; sold, Christie’s, London, November 30, 1979, no. 71, ill. (ex-Count Carl Björnstjerna). I thank Gunnar Heydenreich for sharing his firsthand knowledge of this painting. Koepplin in Basel 1974, vol. 2, p. 787, n. 1. See, for example, the costume of Ceres in Bartholomäus Spranger, Sine Cerere et Baccho Friget Venus (Without Ceres and Bacchus, Venus Freezes), ca. 1590, Kunsthistorisches Museum, Vienna (Kaufmann 1988, p. 265, no. 20.48, ill.). Report by Ian Tyers, Dendrochronological Consultancy Limited, Sheffield, August 2010 (copy, curatorial files, Department of European Paintings, MMA). German painting who is known, for example, to have commissioned the court artist Joseph Heintz the Elder to copy a Cranach (Heintz’s Salome with the Head of John the Baptist, ca. 1601 – 2, Kunsthistorisches Museum, Vienna; see Kaufmann 1988, p. 191, no. 7.28, ill.). 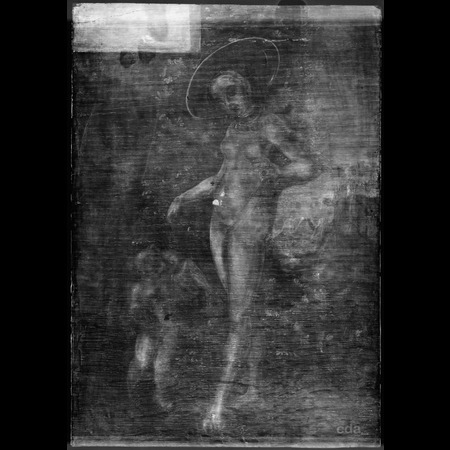 Dated (spuriously) 1530, oil on wood, 35 × 21.5 cm (information from photographs, Sperling File, Department of European Paintings, MMA). See Koepplin in Basel 1974, vol. 2, p. 787, n. 1, fig. 360; Talbot in Sterling et al. 1998, p. 47. Dendrochronological analysis revealed that the wood was cut from a tree in southern Germany, and it indicated an earliest possible fabrication date of 1570. There are bevels around the perimeter on the verso; along the right side the bevel is twice as wide as on the other three sides. The dimensions fall within the bounds of Heydenreich Format B, presumably because the painting is a same-size copy of a lost Cranach original. When the surface is examined in raking light, broad vertical brush marks that seem to originate in a thickly applied priming layer are visible. Imaging with infrared photography and infrared reflectography revealed a thin line describing the contour of the right hip and thigh of Venus and some monochrome gray undermodeling. Infrared imaging carried out with configurations C and B; see p. 276. The inscription in the top left corner, the date of 1530, and the insignia of the winged serpent are original but spurious, that is, the copyist either transcribed them from an earlier version of the painting or inserted them on his own initiative.